Sarah is a very positive and talented trainer! She has made Highland Ridge professional and inviting. With Highland Ridge, my daughter has been given riding opportunities she would not have gotten any where else. We love Highland Ridge! Sarah is an amazing trainer and instructor. Her skill at teaching riding lessons is beyond any thing we have experienced. She has given my daughters opportunities that are priceless. Highland Ridge offers such a family feel that we never want to leave. Love this place and all of the horses. It is a piece of heaven. Our family went to Highland Ridge Stable because Sarah McClintock is one of the best American Saddlebred trainers in the country. We know we will succeed and have a great deal of fun as well with Sarah leading the way. We can't say enough about Sarah! 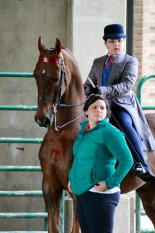 My daughter has ridden with Sarah for years and she has learned so much not only about riding but how working hard has it's rewards. I am so pleased to see my daughter challenged and happy. 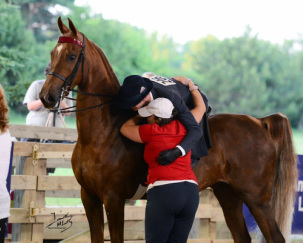 Sarah has created an amazing team environment and we are so happy to be a part of Highland Ridge Stables! I have been taking lessons from Sarah McClintock for almost a year. I consider myself very lucky to have found Highland Ridge Stable and Sarah. As a beginner adult rider I had no prior knowledge of riding. Sarah is an excellent instructor and has been very patient. She continues to challenge me and encourage me. Riding has been extremely therapeutic for me. Taking lessons at such a beautiful place with such a caring instructor gives me a chance to escape from the stress of everyday life. I look forward to my lesson every week and love to be around all the lovely horses. Sarah always has my best interest in mind. Recently I moved out of the area and could not give up my lessons with Sarah. I travel almost two hours one way to continue my lessons. I would highly recommend Sarah to anyone.